Nurtured in a Christian environment, the First Baptist Church Preschool program promotes growth in all areas of development: social, emotional, physical, cognitive and spiritual. Since children do not proceed at the same rate through stages of learning, movement between stages in uneven and is a process of maturation. Learning experiences appropriate to the child's developmental level are offered to acquire a strong foundation for future learning. Our school was established in 1946 as an integral part of First Baptist Church. We provide a preschool program of educational excellence in a Christian environment which emphasizes the development of the total child. We offer preschool classes 2K through kindergarten. We at First Baptist Church feel that a Parents' Day Out program is one more way that we as a church can minister to the family. We feel that parents need to have some days to be able to run errands or attend civic meetings or participate in other functions. Not only are we providing parents some time to do what they need, we are also providing the children with playmates they can enjoy. Parents' Day Out is a ministry, and we hope to truly lead your children as Christ would have us do. For more information about each program, please contact Kathy Samaha or visit the Preschool's website at www.aikenfbcpreschool.org. The Pass It On Kidsignment Sale is a community-wide, biannual consignment sale that takes place in the Family Life Center of Aiken's First Baptist Church. A small percentage of the proceeds goes to the Parents' Day Out program. To learn more, visit the sale's website at passitonaiken2.com. 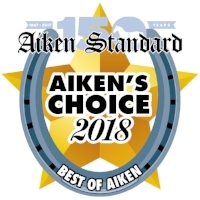 Voted Best Daycare by Aiken Standard Readers!